Higher Pictures 980 Madison is the heart of the Gagosian imperium — always worth a check — but the building also houses some fine smaller galleries. This thoughtful photography gallery is showing Aspen Mays, an artist based in Oakland, Calif., whose astral compositions of dots and diamonds are in fact photograms: pictures produced without a camera on light-sensitive paper. 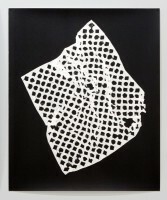 Their patterns derive from bandannas — one belonged to Ms. Mays’s great-grandmother, another to Georgia O’Keeffe — whose decorative forms are reproduced via pinpricks in the obscurity of the darkroom.